P.S. Boonville makes a cameo appearance. 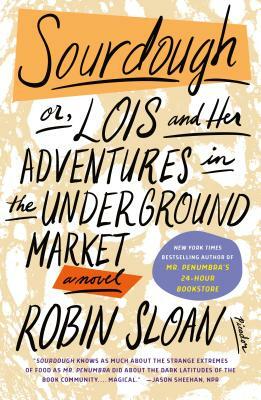 From Robin Sloan, the New York Times bestselling author of Mr. Penumbra’s 24-Hour Bookstore, comes Sourdough, "a perfect parable for our times" (San Francisco Magazine): a delicious and funny novel about an overworked and under-socialized software engineer discovering a calling and a community as a baker. Lois Clary is a software engineer at General Dexterity, a San Francisco robotics company with world-changing ambitions. She codes all day and collapses at night, her human contact limited to the two brothers who run the neighborhood hole-in-the-wall from which she orders dinner every evening. Then, disaster! Visa issues. The brothers quickly close up shop. But they have one last delivery for Lois: their culture, the sourdough starter used to bake their bread. She must keep it alive, they tell her—feed it daily, play it music, and learn to bake with it. Lois is no baker, but she could use a roommate, even if it is a needy colony of microorganisms. Soon, not only is she eating her own homemade bread, she’s providing loaves to the General Dexterity cafeteria every day. Then the company chef urges her to take her product to the farmer’s market—and a whole new world opens up.